“Losing up to 100 strands of hair a day is normal!”- says the Internet! Do you believe in it? Well, I don’t!!! There was a time when no hair clips could succeed in holding​ my hair back… Today, the same clips just slip down my tresses! Even though I never lost more than 50 strands of hair a day, the regular hairfall has left me with just one-third of the mane that I possessed a few years back! So, yes! Every strand of hair that you lose, does count and should be kept in check! 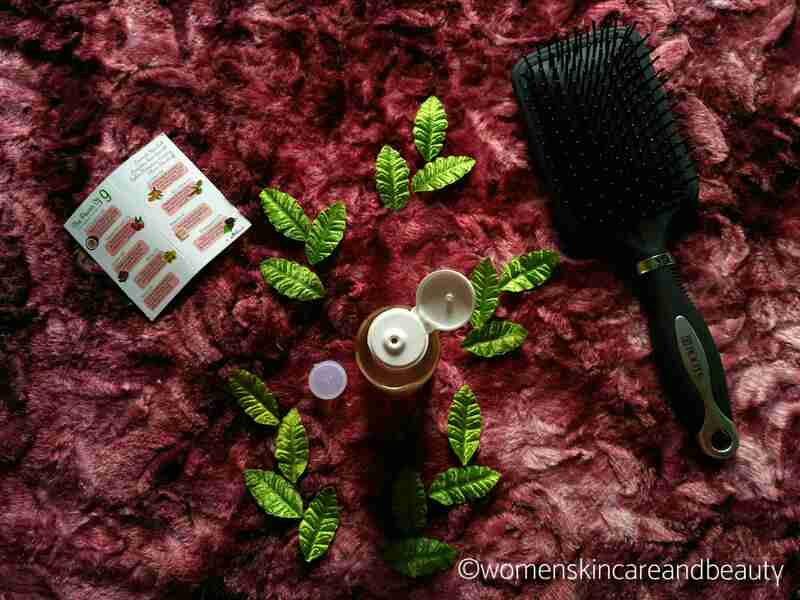 DESCRIPTION: Slows premature greying, promotes hair growth, prevents dandruff, stops hair fall! Natural colour variation may occur in this product. For external use only. 100% chemical free hair oil. DIRECTIONS: Shake well before use. Gentle heating might be required in winter. Apply oil on scalp and massage it for 3-4 minutes. Leave it overnight and wash with alcohol free shampoo. Apply oil 2 times a week​ and for 3 to 4 months for best results. INGREDIENTS: Almond oil, castor oil, coconut oil, grapeseed oil, emu oil, amla oil, jojoba oil, vitamin E, olive oil. • E.V. Coconut Oil: Not only does coconut oil promote hair growth, it prevents dandruff and makes hair thick. 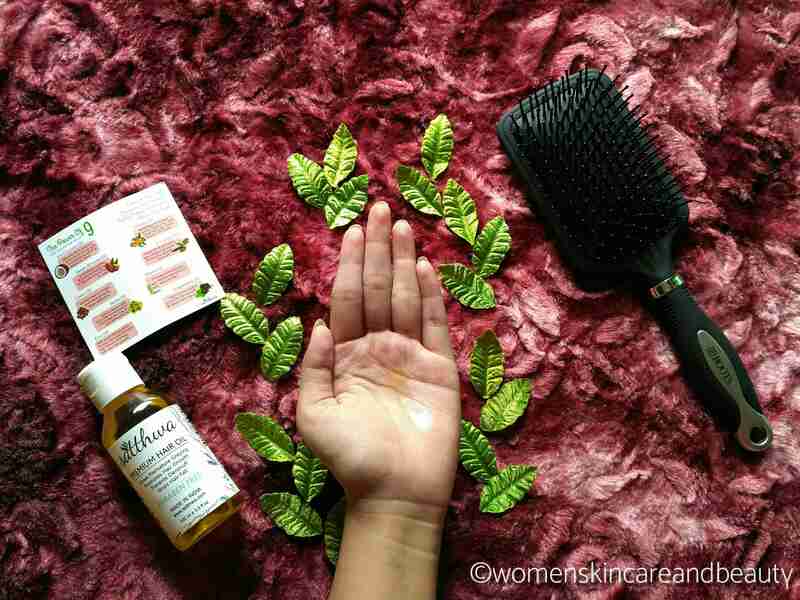 • Sweet Almond Oil: Smoothens cuticles and prevents shedding. It regulates blood flow to scalp. • Castor Oil: Darkens hair and stops premature greying. Stops split ends. • Amla Oil: Rich in vitamin A&C. It’s a Natural conditioner. Minimises hair loss and prevents greying. • Emu Oil: Acts as a fortifying agent for hair. Stimulate dormant hair follicles and help with new hair growth. 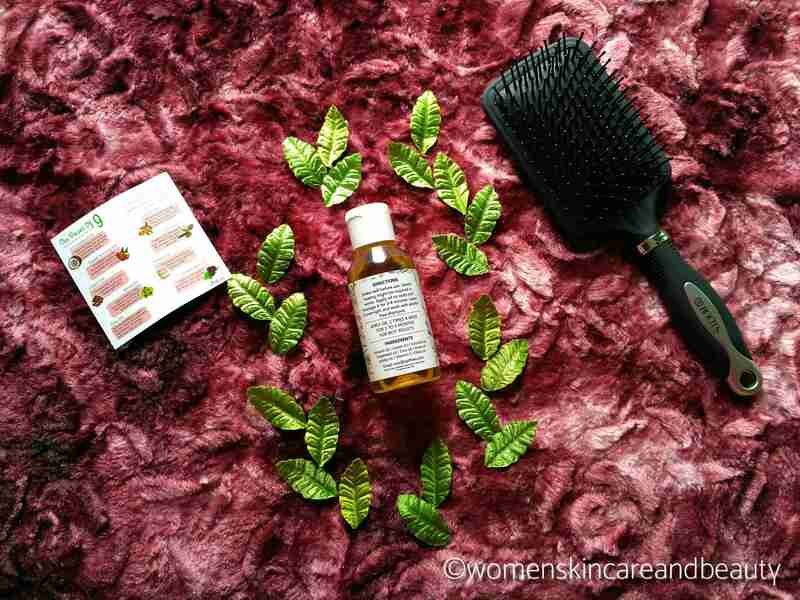 • Jojoba Oil: Antifungal and unclogs pores, repairs hair and cleanses scalp. Helps balance pH levels. • E.V. Olive Oil: Treats dry and damaged hair. Makes hair shine and become smooth and soft. • Vitamin E: Provides antioxidants, keratin strength and reduces fizz. 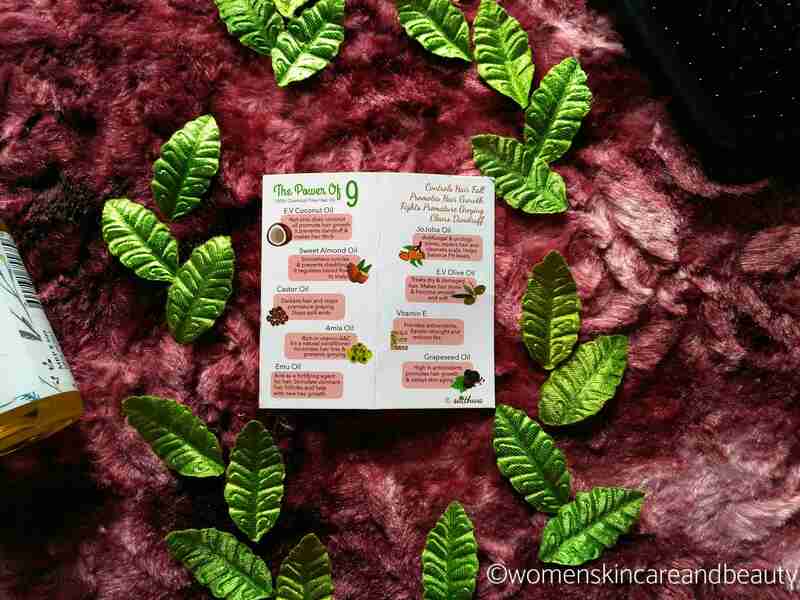 • Grapeseed Oil: High in antioxidants, promotes hair growth and delays skin ageing. COST: INR 599 for 100ml. 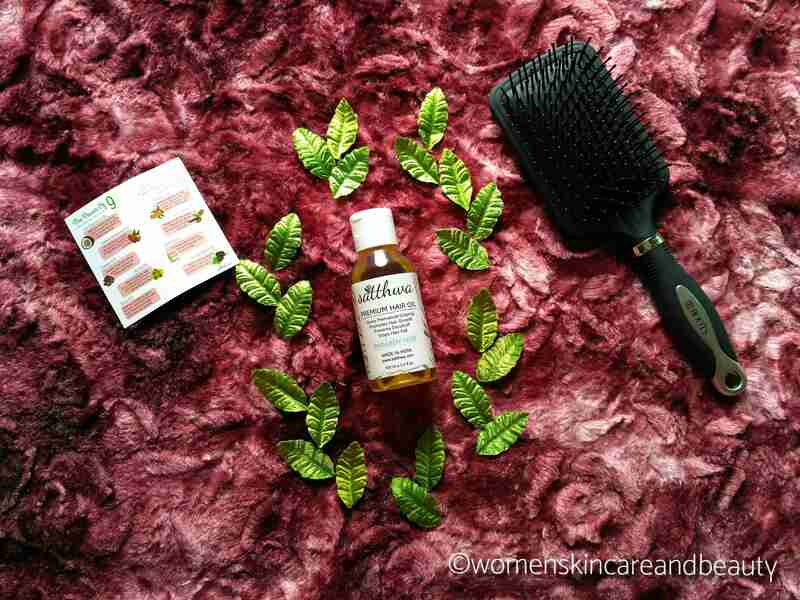 Coming to the effectiveness of this hair oil in removing itchiness and dandruff from the scalp; Initially, I was quite impressed by it when I saw the dandruff vanishing to some extent within a couple of washes, as I started using it regularly! But to my disappointment, it kept showing up again on my scalp within a day or two, and the itching continued without a pause! 1. Available on Satthwa, Flipkart and Amazon, as of now! 2. Completely leak proof and travel friendly! 3. Non sticky and doesn’t stain the pillows; Spreads on the hair with ease; Washes off the tresses effortlessly! 4. Blend of nine precious oils and doesn’t contain any sort of chemicals! 7. Works on the Dandruff and itchiness, although to a small extent! 8. A bottle goes a long way as a little quantity of the oil is enough to cover the whole head! 1. To me, the Oil seems​ to be a little pricey! Nice review. I have no dandruff or itching problems but very much concerned about my falling hair. I can not say how much i am worried about my falling hair. So, i will must going to try this oil. this hair oil looks effective for hair fall problems. Will give it a try. It’s been 3 weeks that I have been using this HAIR oil and I am already in love with this.What a wonderful magical oil, I loved the fact that it has reduced my hairfall to a great extent. Glad our views match. I am always in the look hair oils as I have hair fall issues. Satthwa seems like a very good oil. well thank you for the honest review about the dandruff issue. But i also think that this oil is very heavi; priced at 599 for just 100 ml. I have already got one and waiting to try this out. Loves its composition n the brand too. There ia nothing better than using a natural product. I have been reading a lot of great reviewa about the product. thanks for reviewing it for us ! Wow nice review. If it isnt effective on dandruff then no ways I am trying this but for general use I can think of trying it. This hair oil looks very promising. Thanks for honest review. This hair oil is my one of the favorite. It has benefitted a lot to my hair. Thank you for your honest review. Satthwa has some amazing products for us. I have used this oil before, very effective on hairfall . Thanks for your honest review. I really feel like trying this oil. Hope it helps me. I am using this oil also . And believe me its wonderful and gives me visible results. Now its one of my favourite hair oil.